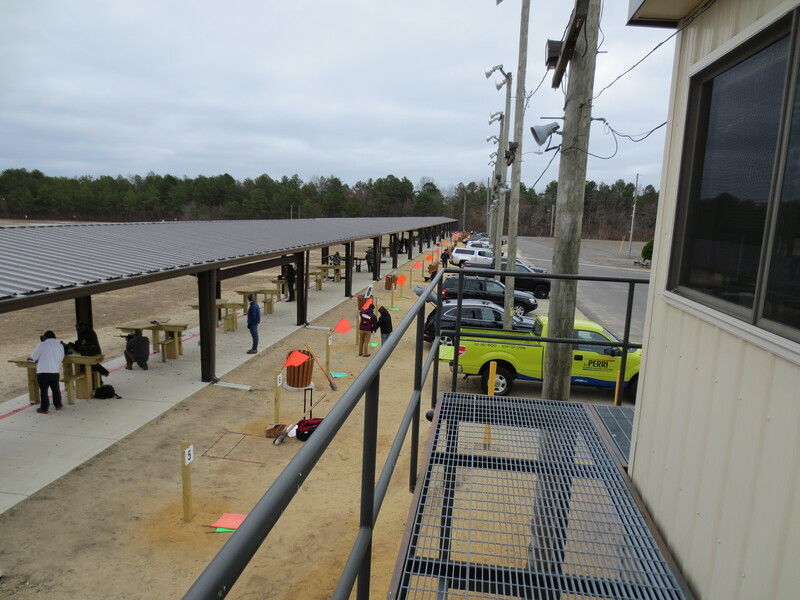 Range safety officer controlled shooting. Targets & safety equpiment are available for purchase. If you choose to bring your own. A variety of targets are acceptable. It is advised that you check with the current range officer before using them. No rental or sale of firearms or ammunition. 1. Treat every gun as if it is loaded, and the safety is off. 2. Keep the muzzle pointed down range. a. ATTENTION ON THE RANGE, ATTENTION ON THE RANGE. WE NOW HAVE A CEASE FIRE, CEASE FIRE. PLEASE CLEAR AND TABLE ALL FIREARMS by removing all magazines and all ammunition lock all actions open and insert your chamber flags. Gather any items you will need to take down range. Step back to the safety line and post your green flags. b. B. THE RANGES ARE NOW CLEAR, YOU MAY POST AND CHECK YOUR TARGETS. WHEN YOU ARE FINISHED DOWN RANGE, PLEASE POST YOUR RED FLAG, AND STAND BACK AT THE SAFETY LINE. FOR NO REASONS SHOULD ANYONE HANDLE ANYTHING AT THEIR SHOOTING STATION WHILE WE ARE UNDER A CEASE FIRE. 4. Cease fires will last a minimum of five minutes, and maximum of ten minutes. 5. Shooters will dispose of their targets, target holders, and spent shells in the appropriate trash receptacles provided, or take it home. YOU MAY PICK UP YOUR BRASS, AND ONLY YOUR BRASS. 6. Do not go down range unless the range safety officer grants you permission. No firearms will be permitted to go down range. This includes pistols in holsters. 7. Do not begin firing unless the range safety officer is present in the tower and has given you direction to do so. 8. Alert the range safety officer of any unsafe act or violation. 9. Cease fire immediately when any person or animal is spotted down range during a live fire period. Notify the range safety officer (orange vest or safety tower) immediately as well as any other shooters. 10. Only firearms legal in the state of New Jersey may be used. 11. All rifles must be equipped with a shoulder stock. 12. No targets or persons on the berm, NO EXCEPTIONS! 13. No targets should exceed more than five feet in height. 14. Paper targets, plastic jugs, tin cans, plywood targets (no more than 1/8 of an inch thick), and clay targets, are acceptable targets. Above ground targets must be a minimum of 15 yards and all ground targets 25 yards. 15.Glass bottles, bowling pins, plywood (more than 1/8 of an inch thick), batteries, produce of any kind, sports balls including but not limited to, golf balls, baseball, softball, tennis balls, stuffed animals, manikins heads or bodies, archery 3 d targets, toys, electronics, solid wood, and books are NOT permitted to be shot on Range 14. 16. ALL metal targets must be inspected by Range 14 staff, and be a minimum of 200 yards, upon approval. 17. Tables will be assigned in order. 18. There will be no cross-range shooting. All shots fired must be forward of your shooting station. 19. Shooters going down range in camouflage clothing must have at least 200 square inches of hunters orange (hats or vests). 20. No quick drawing from holsters will be allowed. 21. Rapid fire shooting is prohibited. Two/Three round bursts are allowed. 22. All individuals on the shooting side of the safety chain must wear hearing protection and safety glasses. 23. Be sure of your target and beyond. 24. All firearms will remain cased when transporting them to and from your vehicle. 25. Only paid shooters are allowed at the shooting stations. 26. No person may occupy a shooting station during a cease fire for ANY reason. 27. Groups requiring 2 or more stations WILL NOT have more than 4 persons at a station at anytime, NO firearms will be moved from one station to another unless they are cleared and cased. 28. All large amounts of waste (plastic jugs, cans ect.) will be taken to the dumpster by the shooter, or taken with you when you leave. WE DO NOT RENT OR SELL FIREARMS OR AMMUNITION.